Since this dram is hard to find here in Taipei, my friend and I sprung at the chance to pick up a bottle together. It had been a while since any Coal Ila whisky had graced my shelf, and I wasn’t sure what to expect from this one. However any CS Islay offering is hardly a ‘risky purchase’ in my book, so I put up very little argument when my friend pushed me to grab it. Definitely a good call. This is such a classic big-flavoured Islay kicker. Very intense and vibrant. It’s perhaps not as complex as some of the other more refined CS Islay offerings. No, this is not a subtle dram to be deconstructed and over-analyzed. This is just a well made and straight-forward whisky designed for sipping and enjoying. The folks at TWE say this “is a whisky capable of bringing joy to the most jaded peathead.” I’d have to agree, this is so easy to like. I challenge you to pour a dram of this and not fully enjoy every moment of it. @PeatyZealot: Brutal, but fun! For me a lot of Islay cask strengths are a bit more serious and involving, so I usually find myself thinking a lot about them as I drink. But this? I prefer to sip this one more casually; usually with a big dumb grin on my face! This tasting note is far overdue, I admit. I tried it in February while on ski holiday in Austria (be sure to check out the little video on YouTube). It is one of my favourite official bottlings, as you will soon find out. It was bottled at natural cask strength, implying also no colouring and no chill filtration. The nose is grand, vibrant and very expressive. All elements of the sea are there. Salt, smoked herring, creosote with loads of smoke, balanced thanks to a dollop of honey and lime zest. Diluted it becomes more accessible and offers breakfast cereals and butter. Kaboom! It explodes in your mouth! Makes me all warm inside. The maritime elements of the nose return. Oysters. Brine. Some vanilla, lime zeste again, hints of burnt rubber (the good kind). Can take quite a bit of water. Becomes less intense, admittedly, but does not lose a lot of flavour. It offers even more. A swimmer. The finish is very long on peat. Fades ever so gently. This is a bodybuilder of a whisky. Not for the faint hearted. 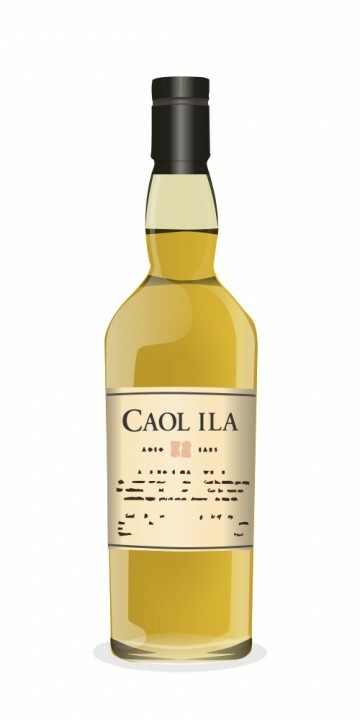 Caol Ila remains at the top of my list of favourite Islay drams. Great review, Mark! This is one of my all-time favourite NAS cask-strength single malts. "Bodybuilder" seems a more than apt description here. The nose is fresh and briny. Peat smoke mingles with delightful citrus notes, and there are hints of grass and apples. A delightfully fresh nose to begin with. The palate almost overwhelms you! It is full-bodied, oily and mighty, very peppery and dominated by salty brine and peat smoke. Wow! Then there are subtle notes of lemon and vanilla. The finish is of medium length and warming, full of brine and ashes. Some smoked ham notes also appear. This is my favourite everyday Islay whisky! You could say that this is young, wild and hot! It is perfect for the hip flask on long walks during wintry afternoons and will forever be part of my whisky cabinet. This review is from my2nd sample of a 20cl bottle. I have sampled this in a Glencairn without water. The colour is pale straw and oily. Nose peat, smoke, green apple peel and a twist of lemon grass. On the palate it delivers a real spicy, smokey punch. Dry crisp green fruit and salted caramel. The finish is long, smokey, spicy, peat, fruity, smoke again leaving tongue tingling spice. Sounds like classic Caol Ila at its rawest, (if that makes sense). But I can never try such high strength whiskies without a touch of water - I find the alcohol overpowers the flavours too much with anything over 50% ABV. Is there a method to sampling them neat, or is it just practice/personal preference? Ever tried the distiller's edition? I am sampling a very small portion of this whisky, after having shared a tipple with a friend of mine the other day. I quite enjoyed my first sip, but I had already enjoyed a couple Compass Box expressions, so I didn't feel it fair to review it under those circumstances. However, here I am, after a long day, finally sitting down to enjoy a dram! This is a very light colored whisky, bottled at 61.6% ABV. Nose: Quite a bit of smoke up front. Some sea air comes in behind the smoke, and there are some tangy (unripe) grapes mixed in. A little seaweed in the back. Palate: Wow! A smoke and tangy grape explosion in the mouth! VERY hot! My mouth is really heating up holding in this whisky. It really is very good, with a fantastic mouth feel. To be real clear, unless you are a whisky fanatic, I would steer WELL clear of this one. Finish: More smoke on the finish. Which, frankly is a bit shorter than I would have expected. With such intensity on the palate, I am surprised at how tame the finish is. I don't think this is the most balanced whisky I've ever tasted. It is incredibly hot in the mouth, and there is a ton of smoke in there. But the other flavors just get lost in that smoke cloud. All in all, this is a great whisky. There are a few drawbacks, like the very short finish. But overall, I really like this one. Very unusual, with the intense smoke and tangy character. I would definitely look for a bottle of this whisky. Today I finished my working day sipping a glass of Caol Ila 12 yo kindly offered by my professor, so I remembered I still had a sample of their Natural Cask Strength edition and decided to give it a try, just to see how they compare. Here's my review! Color and body: very light color, fino sherry according to the Connossr bar. I'm swirling the dram into the glass and watching at its long and thin legs. Nose: sweet, with light but detectable alcohol, strong and aromatic peat. It also shows faint lemony notes. Mouthwatering! Palate: very pungent and massive attack, it warms and coats your mouth. This start is followed by a pleasant sweetness, while some citrusy notes hit the sides of your tongue and, on breathing out, I can also feel a kind of nuttiness that I really like. And of course, peat and smoke at their best! It's a deeper, heartier version of the CI 12 (it should be younger though), but due to the high ABV the flavours are tightly intermingled, you need time to discern between them. But I can assure, it's well spent time! Adding water brings out more sweetness but curiously the alcohol attack becomes almost sharper, while the flavours are a bit flattened. I prefer it neat. Finish: as always with this cask strength Islay malts, the finish stays with you forever, with peat and sweet warm notes and just a hint of liquorice. Satisfying! It sounds mouth watering! I have yet to get into Caol Ila. I think I'm going to have to kill some of these bottles I have open first. I have a bottle of Laph 10yr Cask Strength, and Lagavulin 16yr. Which Caol Ila should I look for first? Should I skip the 12yr, or go for it? 12yr is a great dram in more opinion, the lower ABV allows you to taste the different kind of peat (different from laphroaig's/ardbeg's/lagavulin's one)...at half the price (here in Italy) I shouldn't skip it! nose: Lots and lots of lemon notes. reminds me of the CI unpeated, lemony theme, but with the added phenols, peat and smoke . very fresh, green grass, green apple peel. the ABV is evident.. a nose is different than both 12 and 18. i do think it’s really unique. Palate: Obviously young and kicking! strong peat, with sweet middle and mouth coating. Oily. Salty notes appear after you chew on it a bit. yep! sea spray salty! what a nice touch! Finish : heaps of peat. very warming and long.some bacon notes and spice. the longest of all three in terms of finish. Ace. Yeah, this is a bit softer and easier to drink than the lagavulin and laphroaig monsters. Worth adding to the cabinet! @galg I love this whisky. That amazing Islay peat but with a light body and real freshness. Its a great dram. The lightness makes it good for the warmer weather. Colour is light as possible, almost clear with a node to cheap apple-juice. Nose is smoke and turpentine. Body is rich and filling. First taste is smoke and heather or herbal tea finishing with some sweetness to back bacon (Canadian Bacon). You almost can't go wrong with a Caol Ila - I've had some brilliant independent ones as well. That oily rich texture, and the very nice quite Islay character Caol Ilas usually display, make for very pleasant dramming. Sounds like a cracking dram based on the two reviews so far. This was another taster at The Lark distillery/whisky bar. The nose is peaty, with hints of sweetness and malt. Really meaty and powerful. More complex than it sounds. I would need a few glasses over a few weeks to get to the bottom of the nose. The spirit burn continues for several seconds before fading slowly, bringing the spice back, before the peat and smoke slowly take over. on mine as well. i adore the CI nose. @galg - I agree, it's somehow less meaty than a lot of other Islays, but is just smooth and glorious!